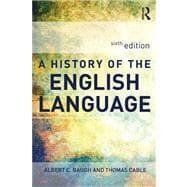 This is an exploration of the linguistic and cultural development of English, from the Middle Ages to the present day. This fifth edition includes new sections on gender issues and updated material on African American vernacular English. English language - History. ; History. ; English language.